The issue of security in the public domain is not so much pre­cipi­tated by increased danger as primarily a problem of ‘inter­passive citizenship’, accor­ding to legal philosopher Gijs van Oenen. In the follow­ing piece he examines the conditions for the transformation of the public sphere into an obsessive medium of security concerns. 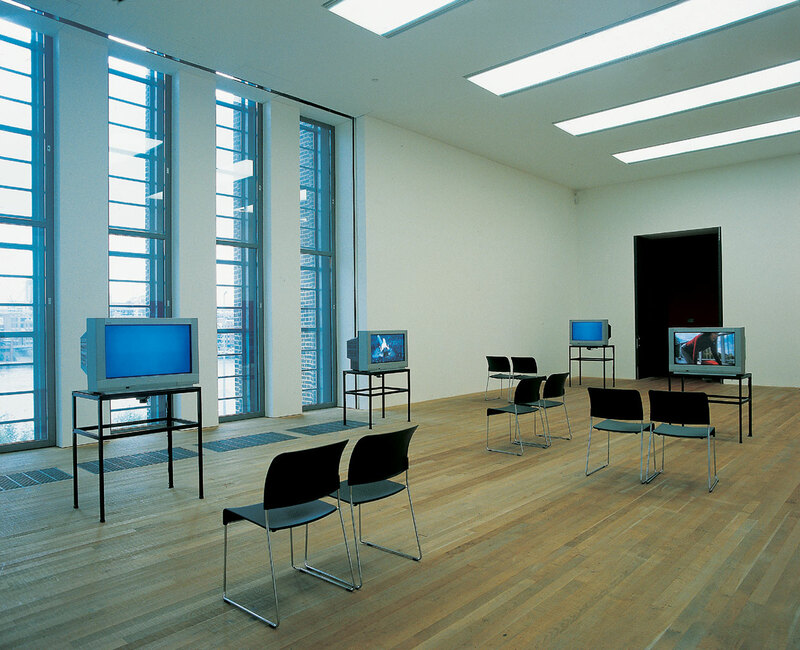 Eija-Liisa Ahtila, The Present, 2001 / 5 x 70 -120 + 5 x 30 , DVD installation for five monitors and five TV spots with sound, 3 x 90. Courtesy Klemens Gasser @ Tanja Grunert Inc, New York / © Crystal Eye Ltd, Helsinki. Eija-Liisa Ahtila, Me/We; Okay, Gray, 1993 / 35 mm-film and DVD installation for three monitors with sound, 3 x 90. Courtesy Klemens Gasser @ Tanja Grunert Inc, New York / © Crystal Eye Ltd, Helsinki. Safety ﬁrst: on this demand for the public domain, modern citizens and their government agree, however much they may disagree in other respects. Safety requires action: tough measures, clear targets. Such targets include: suspicious immigrants, assinine behaviour in public, highway speeding, ﬁnancial swindling, unlit cycling, hooliganism, urinating in public places, organized crime, terrorism, smoking, urban decay, unrepentant criminals, permissive culture. In short, everything and everyone can become a target of ‘security concerns’. One consequence of this obsession with security seems clear. We can forget about the ideal of a civilized public sphere. That was the optimistic idea that public confrontation makes for better citizens – a classic repub­lican ideal that, in the second half of the twentieth century, was advocated by people like Hannah Arendt, Jürgen Habermas and Richard Sennett. Let us call this an ideal of interactive citizenship, situated in what we might call an ideoscape: a ﬁeld of human relations shaped through the incessant exchange of opinions and viewpoints. According to this ideal, people self-actualize not simply as private persons, but also and especially through interaction as citizens. In this interaction nothing is ‘produced’, other than a more sophisticated understanding of what can serve as collec­tive aims. This interactive ideoscape of the public sphere, however, is undergoing a structural transformation, to use Habermas’ classical terminology. I propose that it is turning into an interpassive securityscape. In this medium, the primary quest is not for encounter or confrontation, but for security. The public sphere is turning into a security sanctum, which can be brieﬂy deﬁned as a space in which the concern for civilized behaviour has been outsourced. Modern citizens no longer believe that they can control them­selves sufﬁciently to bear the responsibility for civilized public interaction. They prefer to turn this responsibility and accountability over to others: the government, the police, supervisors, providers, security guards. These old and new managers of public space are responding with a new kind of ‘civilitarianism’, re-educating the citizen in a way that reﬂects present-day political anxieties; in other words, in a rather authoritarian and moralizing way. In my view, this exercise is doomed to fail. The attempt to rehabilitate ‘public man’ collides with a phenomenon that I refer to as interpassivity, following cultural philo­sophers Robert Pfaller and Slavoj Žižek. Involvement or engagement is delegated, outsourced. We would like to get involved, but we no longer believe that we can; there­fore we ask others to get involved, on our behalf. This does not result, however, in obedience or docility toward such others, as promoters of the new civilitarianism hope. Two characteristics of interpassivity stand in the way here. To begin with, delegating engagement does not cause interpassive citizens to forgo their self-will. On the contrary, they persist in an indifferent denial of their public responsibility, even and in fact precisely when called to account for it by those to whom they have delegated it. This is why we see so many manifestations of autistic behaviour in present-day secur­ityscapes. But in addition we are witnessing a less easily explained phenomenon. Interpassivity also leads to an intense, almost compulsive fascination for those who have been entrusted with the care and responsibility for public affairs. An obsessive interest develops in the mechanisms of the system to which the bearers of the delegated responsibility are connected. This meta-involvement, an involvement in the involvement of others, explains the current rise of fascination with (‘new’) politics. What is the condition of the interpassive securityscape? How does it apply in the sphere of labour and that of politics? How has the public sphere turned into an interpassive securityscape? There is a direct relationship between interpassivity, in essence nothing more than a radicalization of the modern ideal of interactivity, and the transformation of the public sphere into an object of ‘security concerns’. Robert Pfaller and Slavoj Žižek constructed the concept of interpassivity to explain how some artworks and media endeavour to take care of their own reception. In interactive arrangements, the artwork delegates a portion of its actualization to the viewer. In contrast, interpassive arrangements adopt the very role normally fulﬁlled by the viewer, namely the enjoyment or the ‘consumption’ of the artwork. The spectator or consumer is made redundant; or rather, his or her involvement in the realization of the work has become superﬂuous. Apparently, the artwork aims to consume itself, actively dis-interesting the spectator in its realization. The archetypal domestic example of interpassivity that Pfaller and Žižek cite is the video recorder. The VCR does more than record broadcasts when we are absent. It watches television, in our place, and more importantly, on our behalf. It delivers us from the need of watching TV ourselves. We feel secure in the knowledge that someone or something is watching on our behalf. This was illustrated by an installation by Eija-Liisa Ahtila in 2002 at Tate Modern. 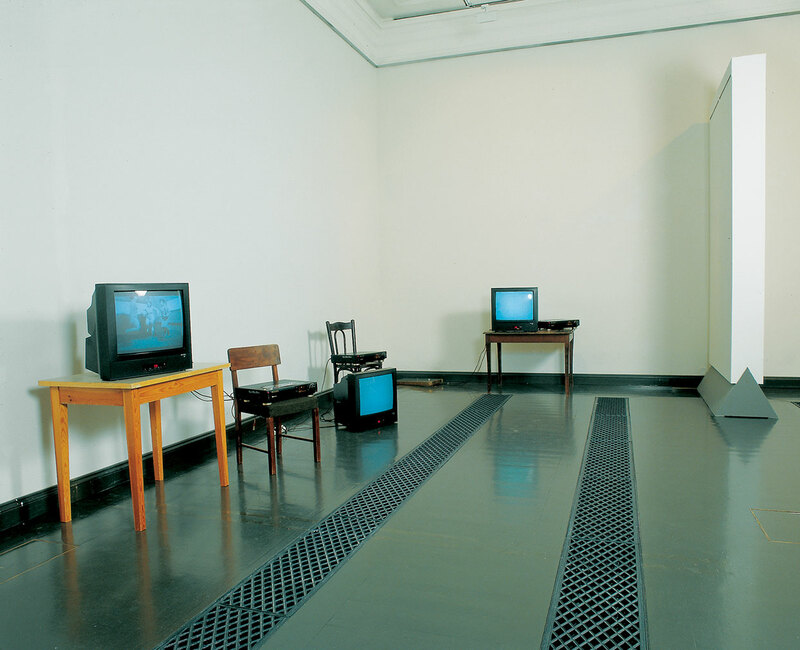 Video recorders and monitors sat on chairs, while visitors were required to stand. The monitors, facing different directions, were broadcasting their content oblivious to human attention. Sometimes they simply just faced each other, explicitly declaring all space in between mediated. The spectator is either shut out, or caught in between, ‘interpassively’. The media enjoyed through the spectators, the spectators through the media, albeit indifferently. The fact that media can enjoy themselves, and each other, does not fully explain why we should delegate our enjoyment to them. Why not just be content that media now seem capable of enjoyment? Why project our enjoyment onto their gratiﬁcation? Pfaller explains this through the principle of the dromenon. This concept generalizes mechanisms such as the video recorder, or the Tibetan prayer wheel, another favourite example of Pfaller’s and Žižek’s. This prayer wheel, which ‘prays on our behalf’, serves to illustrate the perpetuum mobile quality intrinsic to interpassive media, or perhaps to all media. Aimless and vacuous as they are, their motion exerts a strong fascination on those in whose service they operate. This fascination does not affect the content, the broadcast or prayer for example, of what is televised, recorded, or otherwise ‘processed’. Rather it is the sensation of permanent connection to a running medium that has a satisfying effect, even obsessively so. According to Pfaller we in fact delegate our subjectivity to the aimlessly running medium (a pleonasm?). Consider, he writes, how people watching a live football match on television often react awkwardly and irritably if we speak to them or otherwise disturb them. This is not primarily because they are anxious they might miss a crucial moment in the match. More pertinent is their desire to ‘languish’ in front of the television. They want to ‘enjoy’ not in the sense of having fun and being delighted, but in the sense of ‘enjoying’ the protection from the machine they have attached themselves to. This is the machine of the dromenon, ‘a machine that runs of itself’, a pure medium without a message, that ‘stands in’ for one’s own subjectivity. The function of the dromenon is thus to provide ‘cover’ for the spectator’s retreat into oblivion, or self-forgetfulness (‘Selbstvergessenheit’). Interpassivity affects many domains of contemporary society and its institutions. One prominent example is labour. There we see trends like ﬂexibilization, outsourcement and networking. Invariably, this involves a relationship between the structure of labour and the experience of subjectivity of those who perform this labour. The substance of the work, or of the product, is less and less important. For instance, large media conglomerates unashamedly refer to this substance as ‘content’: something, anything, they can proﬁtably haul through their expensive infrastructure. By contrast, mon­itoring, process control and supervision are becoming ever more important. Hands-on has been replaced by, or is becoming the equivalent of, interfaced operation. In this way, a single person can perform the most diverse tasks. Or conversely, a particular task can be performed by anyone. Sociologist Richard Sennett has perceptively analysed this process in his book The Corrosion of Character. The modern organization of labour requires a ‘ﬂexible human subject’, that is, a human being that can adapt ever faster to the demands of the constantly reconﬁgured production process. Flexibility has been turned from a functional requirement into a new virtue. Well-functioning institutions are being reorganized incessantly, transforming ﬂexibility from a means to an end. Employees are expected to eagerly anticipate a change of function or location, even when there is no genuine reason for such a change. The inevitable result is a high level of detachment. Every product imaginable can now be manufactured, but employees have lost their afﬁnity with any particular product. This is the process of interpassivity pur sang: a continual reinforcement of ‘interactivity’, meaning an optimal interaction between the functions of human and machine in the production process, is matched by a loss of involvement and interest in the objective and the product of the process. At the same time, many employees seek compensation for the loss of meaning in their work precisely in such intensiﬁed interaction. They have internalized ﬂexibility as a virtue, as an expression of their own motives and goals. They thus suffer from the experience of an inner ‘ﬂaw’, which they frantically attempt to ﬁll with the very activities that have elicited this experience. A comparable form of implicit, interpassive frustration can be identiﬁed in modern politics. Here too, a loss of interest in the ﬁnal ‘product’ prevails. Involvement shifts to the process of – interactive – ‘policy making’. Again, the focus is not on the substance of any particular policy. What matters more is the reassuring sense of dwelling in the protective proximity of the ceaselessly running process of policy production (PPP). This is the ultimate place where ‘third way’ politics and new forms of populism meet. Both promise citizens ever-greater proximity to the political process, and both are essentially uninterested in its content or results. Both are caught in an interpassive fascination with political power. Interpassivity in politics is the result of a number of recent developments in politics and society, including outsourcing, as already mentioned. In line with current commercial fashion, governments are busily sourcing out everything but their ‘core activities’. Former state agencies and services are transformed into semi-public or even private bodies. Supposedly the relevant activities can be better, more efﬁciently, more cheaply or more reliably performed by private, or privatized, actors. Whether this is true or not, the oursourcing trend has caused great damage to the authority of government. For it has created the impression that almost everything government does can be done better elsewhere. Worse still, that hardly anything need be considered an essential government or state task. Just about every government function can be delegated. Therefore there is no longer anything intrinsically political that requires our commitment, as citizens. And converse­ly, nothing to which we commit is intrins­ically political. This outsourcement of politics is fully in sync with the liberal credo of the autonomous, self-assured citizen who takes care of his own affairs and should not be bothered by government. This citizen considers himself a capable market operator, to be facilitated, not regulated, by government. More importantly, government agrees with this view. In its increasingly ‘inter­active’ form, it is continually engaged in opinion polls and other forms of monitoring citizen’s preferences, rather than developing and implementing substantive views on the interests of nation or society. The citizen, in turn, has unprecedented access to the policy process, yet he has scarce interest in political substance. Expectations and demands in regard to government are rising dramatically – as dramatic as the decline in membership of political parties. Such is the interpassivity of contempor­ary politics. A radicalization of interactivity is matched by a loss of substantive interest. Like labour, politics these days is mainly about process control. The system is up and running; all it needs from people is ‘mon­itoring’. Yet at the same time there is an intense sense of connection with the political process, an interest that can almost be called obsessive. The odd thing is that this interest is particularly present in those who have developed distaste for the political system. True, they are prone to complain about the inconclusiveness of actual politicians, but this merely reﬂects their virtually limitless faith in politics’ potential. At the same time they envy politicians their privileged position. Not because of their privilege of power or status, for politicians no longer enjoy such privileges – as citizens know full well. No, it is about the privilege of interpassivity: the protection that they presume one enjoys in the vicinity of PPP, the constantly spinning policy production process. Politicians are plugged in to this process, and the angry citizens suspect that this is the secret reason why politicians enjoy their profession. The envious citizens want to be ‘plugged in’ as well. Not in order to participate in deciding the content of politics, or – any more than with the football match on television – because they might otherwise miss vital moments. What they do want is simply the protection of politics as dromenon. As political subjects, as citizens, they would prefer to experience oblivion, and any intervention from the outside is perceived as a painful reminder of their existence as concrete citizens, with concrete social duties. They yearn for the experience of interpassive politics, not because of its practical policy effects, but because of the (temporary) release that it seems to offer from their practical social responsibilities. What about interpassivity in relation with security, and the public domain? Indeed I think the same mechanisms can be observed here. A recent minicontroversy, aptly analysed by Henk Hoﬂand, the eminence grise of Dutch journalism, can serve to illustrate this. Around Christmas 2003, 200,000 Amsterdam households received a questionnaire from the ‘Registratie Orgaan Nederland’ (‘Netherlands Registration Organ’). People were instructed to tick off a box, stating whether they knew any illegal immigrants, and if so, whether they were willing to turn them in? This ‘organ’, however, was not a government agency, but a pseudonym for a project by artist Martijn Engelbregt, working in association with the well-known political-cultural centre De Balie. This caused widespread outrage: partly because of possible associations with the deportation of Dutch Jews during World War II, this issue was widely considered too sensitive to exploit for an art project. But Hoﬂand realized that an entirely different sensibility is being injured here. As he wrote, ‘Holland may be on a crazy indivi­dualization course, out-of-control drivers may ﬁre machine-guns at radar devices, bus drivers may well fear that they won’t make it home alive today (…) – but send a printed questionnaire by mail, and things change altogether. Authority still exists, you might say, but what authority.’ In my terms: Engelbregt offended interpassive sensibil­ities. Citizens have no problem with excessive, emotional behaviour in the public sphere. They actually enjoy it. However, the questionnaire touches on the even more excessive but secret enjoyment they experience through their proximity to PPP. Filling out the questionnaire makes this proximity explicit and unveils the enjoyment it entails. Thus Engelbregt’s interrogation in fact mocks the citizen. The questionnaire causes him the embarrassment of being caught indulging in this interpassive enjoyment, his most treasured but most secret excess. As a Lacanian like Žižek would say, more ‘common’ public excesses exist only to cover up this one most secret excess. As discussed above, the modern public sphere originated through the principle of ‘interactivity’. Citizens used to confront each other publicly, in the press as well as in the street. They not only let their opinions be known, they also created a new domain, the domain of public opinion formation. Here opinions were not simply ‘aired’, but discussed, defended, reviewed, and further developed. The rise of the public sphere thus bolstered not just individual but also collective opinion formation. Obviously, the public sphere has been prey to many ‘colonizing’ tendencies and interests, especially in the last century. These have modiﬁed and restricted, but in a certain sense also radicalized it. For instance, it has long been under the powerful inﬂuence of financial interests, especially in the United States. In addition, it has been signiﬁcantly ‘mediated’. Such mediation created distortions and misrepresentations, but more importantly, it fostered interpassive developments. The media – and particularly the mass media, such as television – after all function in ways comparable to those described above for labour and politics. They radicalize the interactive nature of opinion formation, while simul­taneously ‘formatting’ it in speciﬁc ways (think only of the term ‘infotainment’). The spellbound tv-citizen is bombarded with an ever faster spinning circus of opinions, which quickly lose their substance yet retain their fascination, as something ‘new’ is always being produced. The culmination point is ‘breaking news’, which rarely contains real live action, but which does create a sense of being intensely connected to the ‘news production system’. Like the PPP, this system runs at full tilt, without however creating much interest in its aim or result. The ‘interpassivization’ of the public sphere also means a reduction in the interactive capacities of citizens, threatening the communicative quality of this sphere. The problem is not so much that citizens cannot recognize what standards and what behaviour are necessary to maintain a civilized public space. They can. But they increasingly declare themselves incapable of acting accordingly. They simply no longer see themselves as having the required capa­cities of self-control and self-limitation. This is what the Netherlands Scientiﬁc Council for Government Policy, in its recent report on ‘social norms and values,’ called ‘the burden of behaviour’, thereby referring to the fact that ‘a large and growing number of people, in their behaviour, no longer live by the values they claim to strive for’. The prototype of this citizen is the guy who, when asked in court to account for his aggressive behaviour in public space, says: ‘I just happen to have a short fuse.’ Rather than reminding himself how to act in a civilized way, such a short-fused citizen prefers to cruise interpassively in public space. This attitude can manifest itself in many different ways, which have ‘experien­cing emotion’ as their common denominator. Increasingly, contemporary society is seen as a kind of ‘experience machine’. Which nowadays deals with interpassive experience: citizens literally let experience ‘get to them’. This can be at a football match, a royal wedding, a maﬁa funeral, a commemoration, a demonstration. The ultimate form of such collective emotional experiencing is probably the ‘ﬂash mob’: people who respond to SMS instructions to gather, en masse, at some urban hotspot, to languish there interpassively for a few minutes, demonstratively and pointlessly. The public sphere increasingly becomes a stage upon which interpassive roles and sentiments are played out. Emotions are experienced, reputations ﬂaunted and frustrations vented, de-subjectiﬁed and without aim. The mood can be joyful or grieving, a silent march or a loud display of aggression, and one can instantly change into the other. Someone who happens to be ‘interactively’ present in this space has no way of knowing whether he will be perceived as a supporter or as an opponent. A good example is provided by my own experience on the late afternoon of 8 May 2002, on the Coolsingel boulevard in Rotterdam. Two days earlier the ‘revolutionary’ would-be politician Pim Fortuyn had been assassinated, and many people were lining up in front of city hall to sign the condolence books. From the shopping area of the Lijnbaan, on the opposite side of the Coolsingel, a vast legion of Feyenoord supporters ﬂowed across the street at the same time, in festive anticipation of the UEFA Cup soccer ﬁnal later that evening. The two groups with their very different emotions went together surprisingly well; they encountered each other effortlessly and without conﬂicts. The nature of the emotion was less important than the yearning to experience it along with others in public space. For the modern citizen, participation in public sphere means collectively experien­cing emotions. He wishes, as it were, to be plugged into the emotion machine that is deployed in the public sphere. It is the public equivalent of plugging into a Discman, mobile phone or video recorder. People continually seek out the protection of the dromenon: the spinning object or process that simply through its proximity manages to provide us with the sensation of protection and oblivion – the ontological core of what René Boomkens as far back as eight years ago called the ‘security machine’, ‘all those practices which in the absence of a lively public domain (…) take care of the protection and supervision of our daily lives’. This is the paradox of the dromenon: it is an ‘attachment machine’, the most impor­t­ant product of which is, ironically, detachment. Citizens feel ever more deeply ‘involved’, but their commitment is in fact ever decreasing. Public demonstration becomes a medium for oblivion. Once facil­itating self-formation, the public sphere now promotes self-forgetfulness. It enables us to delegate our subjectivity to the interpassive emotion machine. The ‘security issue’ in the public sphere is thus to a large extent an issue of inter­passive citizenship. The modern citizen no longer feels capable of operating subject­ively, or interactively, in public space. If required he can easily ‘plug in’ to PPP, the always spinning public policy process, but simultaneously he feels unable to intervene in that process. What the modern citizen wants is not to commit, but merely to ‘join’. He does not want to act, but merely to appear. Whatever happens, he is neither for nor against, but simply ‘present’. The contemporary citizen is, in short, a one-person ﬂash mob. He seeks protection and security, but in doing so only makes the public domain more unstable and more insecure. The enjoyment of the dromenon is simultaneously the enjoyment of the loss of one’s own resilience, and that of the communicative quality of the public sphere. This explosive interpassivity is the real security issue of our society.